The Solar Dynamics Observatory (NASA) has collected data, photos and video, from the event that occurred today, March 7th, 2012. Two very strong X-class solar flares shot out of the sun which are also known as a CME or Coronal Mass Ejection. This solar energy is shooting across space at an incredible 1,000,000 Miles per hour and is also being described as a Solar Tsunami. Reading information found on the Space Weather Prediction Center, you can see that in the past 24 hours we have been in a "S3"level Solar storm and there is a warning that suggests that people should avoid traveling in high altitude commercial flights due to a higher level of exposure to proton radiation. 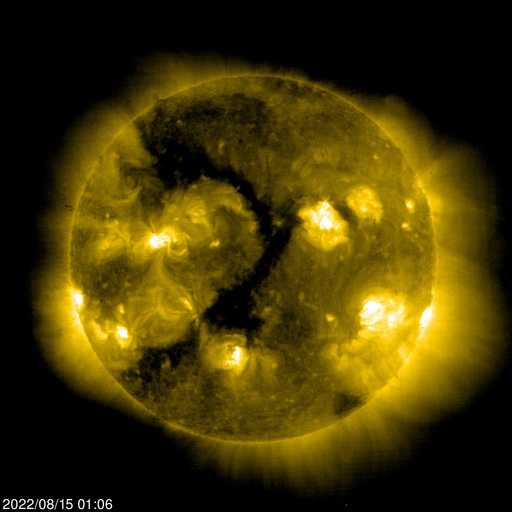 Here is a video online of the CME and Sunspot 1429. The Solar and Heliospheric Observatory is a fantastic international project between Europe and the US for the study of the Sun. (NASA, ESA). Knowing that we are experiencing solar storms, I wanted to show what is used to help measure them. What are the 12 on board instruments? Able to measure core temperatures of the sun, interior rotation and gas flows in the solar interior, and acceleration of solar wind. Also has the ability to measure coronal waves and solar tornadoes. SOHO has an orbit between the Sun and Earth, actually is 1.5 million kilometers away from the Earth, and With this orbit, it has a constant view to study the Sun. SOHO also discovered over 2,000 comets, making this a valuable tool in astronomical history. SOHO has twelve instruments on board which aids us in the study of the Sun and helps us to measure and predict Space Weather events. CELIAS - Charge, Element & Isotope Analysis System. This measures the solar wind and detects solar storms. COSTEP - Comprehensive Suprathermal & Energetic Particle Analyzer. this detects and classifies solar energy particles that come from the Sun, interplanetary and galactic origins. EIT - Extreme Ultraviolet Imaging Telescope. EIT shows the full disc images of the sun in different colors in extreme ultraviolet spectrum. ERNE - Measures high-energy particles emitted from the sun and from the Milky Way. GOLF - Global Oscillations at Low Frequencies, measuring the solar internal structure. LASCO - Large Angle & Spectrometric Coronograph. LASCO measures the outer solar atmosphere or corona. MIDI - Michelson Doppler Imager/ Solar Oscillations Investigation. Measures solar acoustic waves and the longitudinal component of the Sun's magnetic field. SUMER- Solar Ultraviolet Measurements of Emitted Radiation. Measures plasma flows by temperature, density which helps to calculate the solar atmosphere. SWAN - Solar Wind Anisotropies An instrument that measures the rest of the sky by detecting hydrogen that is blowing into the Solar System from interstellar space. UVCS - UltraViolet Coronograph Spectrometer. Measures Ultra violet light of the solar corona by creating an artificial solar ecplipse. VIRGO - Variability of Solar Irradiance and Gravity Oscillations. Calculates the "Solar Constant" by measuring solar intensity oscillations. Doubt has surfaced regarding the importance of the National Weather Service and there is a bill that may be passed by March 16th to reduce it's budget. Today a story with a graphic came out in USA TODAY, I wanted to share the graphic and with this, I wanted to urge readers to sign the petition to stop budget cuts which help fund the very source of vital weather alerts and information. After watching recent news, how can we allow budget cuts, when it is clear that many lives were saved by the early warning from the NOAA's Storm Prediction Center. Please find the link right under the graphic to sign the petition.